These five shorts explore the power of community and common bonds. 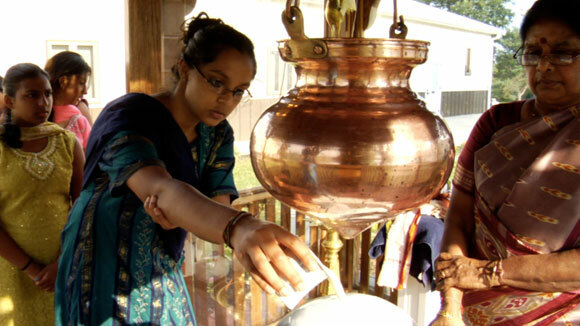 Indian Summer (17 min, Mridu Chandra) finds young Indian Americans at a Hindu summer camp. An American Mosque (19 min, David Washburn) shows the resilience of rural Californian Muslims when faced with a hate crime. Spoils: Extraordinary Harvest (21 min, Alex Mallis) profiles diverse New Yorkers who are united by a common nocturnal activity. Wolf Mountain (7 min, Sam Price-Waldman, Brendan Nahmias, Dan Duran) explores the spiritual link between a woman and the wolves she cares for. Greenland Year Zero (25 min, Anders Graver, Niels Bjørn) reveals the lives of teenagers in a small Greenland town poised for great change. Indian Summer follows kids at the Hindu Heritage Summer Camp in Rochester, NY as they learn meditation, yoga, and how to practice Hinduism in a largely Christian country. This short documentary brings together first generation Indian American youth with similar feelings of alienation to document their religious and cultural point of view. They demystify the basic tenets of Hinduism for themselves and for us, they express a deep need for community, and they show us what it takes to be a Hindu in America. This is the first in a trilogy of short documentaries that the filmmaker is making about Indians in America. Indian Summer – Trailer from Mridu Chandra on Vimeo. An American Mosque is a pastoral story about Islam in America and the enduring belief in freedom of religion. The film follows a group of Muslim farmers as they struggle to build their local mosque only to see it destroyed by arson. In the wake of the fire, questions abound: Who committed the crime? Is the arson an act of hate? How will the community respond and rebuild? Despite their loss, the film’s central characters are unrelenting in their conviction that all Americans are entitled to a religious sanctuary and the right to practice their faith openly. AN AMERICAN MOSQUE – trailer from David Washburn on Vimeo. Spoils captures intimate portraits of 3 New Yorkers on a journey through the culture of dumpster diving, illuminating a practice as old as agriculture. Spoils: Extraordinary Harvest (trailer) from Alex Mallis on Vimeo. WORLD PREMIERE Tonya Littlewolf has rescued wolves all her life. At a sanctuary in the empty California desert, she cares for 14 majestic wolves that have been rescued from breeders. Yet, as she cares for these spiritual creatures, even feeding them mouth-to-mouth, Tonya knows that wolves belong in the wild. Wolf Mountain is a beautifully shot portrait of Tonya that goes deep into her spiritual connection with the incredibly serene and misunderstood animals. US PREMIERE Greenland Year Zero is both a short documentary and cinematographic journey in a country presently facing some of the greatest changes in its history: political independence and autonomy from its former colonizer, Denmark, visible traces of climate change and new oil findings, that give birth to dreams of considerable future profits. The film experiments with layers of sound, landscape cinematography and with stylistic renditions of everyday life in Greenland. It portrays the world of 4 High school students in the small town of Aasiaat on Greenland’s west coast, where just a hundred miles offshore companies are drilling for oil. If the drills prove positive, the town as well as the life conditions of the young students will change forever. Greenland Year Zero from anders graver on Vimeo.